Abstract: This paper proposes the development of the mass driver to launch atmospheric sounding probes to study the ozone layer of the Earth’s atmosphere. At least one of the proposed mass drivers is to be installed on Antarctica to study changes occurring in the ozone layer there. The mass driver technology is developed to support the mission to planet Earth. This atmospheric sounding mass driver serves as a basis for the further development of a space-capable mass driver. Abstract: There is a need to familiarize the public-at-large with the concept of power transfer by microwave beam by some highly visible demonstration that could be carried out repetitively in science museums or similar public structures. A free-flying helicopter model that would be both positioned and powered by a microwave beam would meet this need. All of the basic technology and hardware is available for such a demonstration. In the time period of 1964 to 1970 highly successful demonstrations of (1) a beam powered but tethered helicopter and (2) a beam riding helicopter with power supplied by means of an electric cable were made. Since that time much progress has been made in the technology of beam formation, reduction of rectenna mass, and availability of electric-powered, radio-controlled model helicopters, that would make the demonstration of an untethered flight of a microwave powered helicopter readily achievable. The specifications for the proposed demonstration would be basically determined by the availability of model electric powered helicopters which typically have a three or four foot rotor diameter and fly on less than 500 watts of DC power. The rectenna size would be four square feet, and the transmitting antenna would be three feet in diameter. The helicopter would use the face of the transmitting antenna as a launching and landing pad. In typical demonstrations the helicopter would rise vertically to a maximum of twenty feet where it would hover and possibly ascend and descend under the control of the viewer. As a safety precaution the viewer would be screened from any stray microwave radiation by means of a transparent glass screen with an “invisible” wired mesh embedded in it. Abstract: An approach is described for the return of crews to the moon by the end of this century. It is accomplished through the use of existing transportation systems or their derivatives, e.g. Space Shuttle, Titan IV and/or Ariane V, and the Centaur stage. New developments include a new lunar excursion vehicle and a derivative of the Apollo command module, used for crew delivery and return. As the majority of the transportation infrastructure already exists, the approach offers low risk and low cost. Also described are the scientific and technological benefits of such a program. Space operational scenarios, a critical aspect of lunar expeditions, are developed along with cargo manifests for the first three missions, the last of which is the first piloted mission, performed with a crew of two. A program schedule illustrates how the piloted mission can be achieved by the year 2000. It is concluded that the proposed program is feasible and of considerable value. Further, it is shown that Early Lunar Access may be structured as an international venture, with the participation of several partners, mutually dependent on the others to achieve program success. Abstract: Conceptual designs for microwave-boosted orbital shuttlecraft (i.e.. “Lightcraft”) are presented. Inflatable tensile aerospace structures utilizing advanced composite materials technology are analytically investigated. A survey of candidate microwave-energized engine concepts is assembled, and various methods of integrating the various optics/airframe/engine requirements are suggested. A rough, first-order estimate of the weight breakdown of a representative 10m vehicle is assembled. One propulsion concept suitable for the low altitude, low velocity maneuvering/stationkeeping role is identified. Two other hypervelocity engine concepts are highlighted (along with an innovative method for active drag reduction): the potential of one such thruster—a repetitively pulsed-detonation engine (PDE)—is analytically explored. The atmospheric limitations of microwave and millimeter wave power transmission for this mission are discussed. Finally, thermal management issues and promising future research directions for the microwave-boosted Lightcraft project are discussed. Abstract: Round-trip missions between highly eccentric Earth orbit (HEEO) and the surfaces of near-Earth asteroids (NEAs) benefit greatly from the use of asteroid-derived water as a propellant. The most advantageous schemes utilize solar thermal or nuclear thermal propulsion with water as the working fluid (the “steam rocket”). Multiple round trips by steam rocket between HEEO and NEAs can achieve mass payback ratios of 50:1 to over 100:1, compared to about 2.4:1 for the best scenarios for lunar missions using lunar-derived liquid oxygen (LLOX). The MPBR advantage of NEA-derived propellants arises from the low delta V required for soft landings on many NEAs, the very low delta V for return from these asteroid surfaces to Earth orbit, and the near-optimal specific impulse of the steam rocket. The great resource diversity of the NEAs, especially the high abundances of volatile elements in carbonaceous asteroids, adds to their value. The main disadvantage of NEAs relative to the Moon as sources of materials for use in near-Earth space is the trip time. Abstract: A vital element for space exploration and utilization is the ability to affordably place large quantities of consumables and building material into low earth orbit. Calculations and supportive data indicate this can be done with a large hydrogen gas gun referred to as the Jules Verne Launcher (JVL). We present a design for the JVL based upon the concept of side injecting preheated hydrogen along a long barrel. This dramatically reduces the peak pressures in the launcher as well as the pressures and g-loads at the vehicle. The JVL has the promise of reducing pay load delivery costs to Low Earth Orbit (LEO) to below $500/kg. The Super High Altitude Research Project (SHARP) is a conventional two-stage hydrogen gas gun which is configured to launch 5 kg packages on suborbital trajectories. It is the first step towards the much larger Jules Verne system and will demonstrate several important features of the larger system. SHARP is currently in the middle of a series of tests aimed at its first milestone. This is to launch 5 kg at 4 km/sec horizontally. In its inclined configuration SHARP should launch vehicles to apogees in excess of 400 km and ranges in excess of 700 km. Abstract: Metallic aluminum is a valuable engineering material in space, with many uses, e.g., as electrical conductor and structural material. Fortunately, aluminum is abundant on the lunar surface, occurring as the oxide, complexed with other metal oxides to minerals such as anorthite. A concept to produce aluminum from lunar oxides is proposed. It involves separation of oxides at elevated temperatures in vacuum, then the electrolysis of aluminum oxide dissolved in a fluoride melt. Oxygen and calcium metal would be by-products of the process. Abstract: Structural materials that can potentially be produced in-situ from lunar resources include sintered regolith, glass, or glass-ceramic blocks, plates, and beams. The total volume of each of these components will be on the order of 1 cubic meter, limited by processing constraints. Joining of basic building units will thus be required to produce large lunar structures. In this paper, ceramic-ceramic joining methods are applied to the potential products of lunar soil. Joining options and associated issues are presented. A series of experiments using simulated lunar soil was performed for selected joining techniques. Results indicate that both material selection and heat treatment of components are areas with significant issues which will require further research. Abstract: Near Earth asteroids are one of the least well characterized potential sources of extraterrestrial materials. This poor characterization is mainly due to the fact that only a tiny fraction of the NEA’s thought to exist have yet been discovered. This paper takes a look at the technologies being used to search for near Earth asteroids and the programs which carry out the search. Future prospects for the search are then examined, including the only current proposal for a large scale search program. The conclusion is that such a program should probably be implemented, but that it would benefit from a delay on the order of ten years. This would give time for current programs to greatly expand the base of known asteroids, providing a more firm statistical basis on which to plan a comprehensive search. In addition, such a delay would allow for improvements in data processing and communications technology which would facilitate the conduct of the search. Abstract: It is proposed that the “Deep Black” satellite surveillance and reconnaissance assets operated by the United States, and similar systems operated by Russia, be merged to provide photographic coverage of national and sub-national activities which threaten the peace of the world. Since threats to the peace are the responsibility of the United Nations Security Council the new entity should be under that body’s jurisdiction, and could be called the United Nations Satellite System (UNSATS). Such an addition to Mission to Planet Earth is as urgently needed as the proposed environmental monitoring that awaits the development of new monitoring satellites and a comprehensive earth monitoring program. In comparison to proposed earth environmental monitoring the “Deep Black” technology already exists and is being used, only the political will is needed to implement the proposal whose justification is the perspective that a more open world, transparent world, is a safer world. The major barrier to the implementation of UNSATS is not technology, it is politics. Abstract: This paper assesses the law and policy pursuant to which space mining and related industrial activities could actually proceed sooner than most imagine. One of the fundamental economic incentives for colonizing space has been its vast potential for natural resources to provide for our needs on Earth and in space. The primary barrier to the development of extraterrestrial resources is neither high capital requirements nor technological obstacles. Rather, it is the currently perceived investment risk associated with the presumed absence of legally binding rules to govern the development of celestial resources. Considering United States mining law, and the international support generally found in current treaties, conventions and protocols for natural resource appropriation in space, in addition to the trend toward globalization of free-market systems, it is now possible to suggest a straightforward legal regime which merges principles from these previously diverse areas of terrestrial law to form a practical framework for peaceful and productive in-space mining ventures. Abstract: This paper briefly examines space programs currently conducted, and under development, by NPO Energia. These progams range from basic communications satellites to manned spacecraft. The author will also give an overview of the ramifications that could result from Western utilization of NPO Energia space technology. Abstract: This paper addresses the generally recognized, diffuse and drifting nature of America’s current national space policy. Initial motivations and underlying justifications need to be revisited…reassessed anew. Two broad areas of program policy can help illuminate underlying justifications for an ongoing, strong commitment to space exploration, exploitation, and human occupation: (1) outbound, back-, and cross-contamination of planets, spacecraft, and interstitial space, and (2) those space-related, manned activities that demand knowledge of, and interaction with, the very essence or nature of humankind. Revisiting both of these program areas can offer a reassessment and perhaps reaffirmation of basic philosophic constructs for why humankind must continue to explore, exploit, and occupy space…and how it will do so. Abstract: Military space systems exist to support worldwide military operations. In an increasingly fragmented and dangerous world, the contribution of space systems for navigation, surveillance, communications, weather prediction, warning and battlefield preparation is vital. In 1991, the Department of Defense (DoD) installed a new acquisition process for all systems (including space systems) designed to provide rigid traceability from the first statement of a new operational need to the fielding of a combat capable system. This process is triggered by the operational needs of the ultimate user of the new capability and must be used by all of DoD to field new combat or support capabilities. Within the USAF, operational space systems have been assigned to Air Force Space Command. Air Force Space Command will carefully weigh support to current or future military missions by fielding, upgrading, modifing and operating space systems. New technologies and new capabilities must demonstrate clear operational and fiscal superiority to successfully make it through the review and approval process. New military space systems must compete for funding on the same terms as other military systems. Abstract: The lunar base and lunar base agriculture are dependent on the reliable flow of materials through the system. Solid, liquid, and gaseous materials are cycled in controlled flows between the base habitat, the composter-recycler, and the agricultural modules. Delivery of C02 enriched air from the base habitat and composter-recycler to the agricultural chambers via forced air ducts is discussed as well as the impact on plant growth by the delivery system. Return flow of 02 rich air is also presented. The handling of solid plant growth medium and plant materials by conveyor systems is discussed as is the handling of contaminated solid materials. Abstract: The paper discusses how a vegetarian diet might be beneficial to people living on the moon, free-space settlements, or other planets. The argument is made from a logistical perspective. Some medical results are cited so as to suggest other ramifications of continuing with a vegetarian diet. This paper reviews four topics: water usage, job performance and oxygen use, the human body’s calcium balance, and the health benefits of miso, a soybean paste. The combined results of not eating meat or transporting animals would be less water required for a mission, astronauts with a better state of health, and mitigated body damage due to weightlessness and radiation exposure. Abstract: It has become apparent over the past few years that technology is advancing at a rate beyond even the wildest expectations. It is difficult to keep up with all the aspects of a changing surgical practice let alone those technologies which promise to change the future of surgery. An example of this rapid change is laparoscopic surgery. The technologies behind this innovation have been in place in academia, industry and business for decades, even though they appear new to physicians. The application of these technologies resulted in telepresence surgery, a remote form of surgery which will have applications to space medicine by permitting surgeons to operate upon patients in space from earth. Abstract: In artificial gravity, conformance to the hypothetical comfort zone does not guarantee an earth-normal environment, nor does it sanction design based on terrestrial norms. This paper begins by examining the range of gravity environments encompassed by the comfort zone. It compares Coriolis slope distortions with typical slopes in terrestrial architecture. It then offers a detailed analysis of the abnormalities inherent in relative motion through artificial gravity, using stair-climbing and material-handling as prototypical activities. The effect of Coriolis acceleration is such that it is impossible to design a stair for artificial gravity that meets the terrestrial design requirement of constant apparent slope at constant velocity in both the ascending and descending directions. Coriolis forces may also significantly reduce a person’s effective lifting and carrying strength, even under partial gravity conditions. The only way to simulate a normal gravitational environment, with minimal Coriolis acceleration and rotational cross-coupling, is with a maximal radius of rotation. Where a large radius is not possible, habitat module orientation becomes important. The most comfortable orientation places the module axis parallel to the rotational axis. A deliberate, proactive approach to design may make artificial gravity more feasible by specifically planning for abnormal gravitational effects at small radii. Abstract: While life in Space has received a lot of attention, there has been little consideration given to what happens when someone dies there. But death is a part of the natural history of life and deserves serious study. The emotional aspects are considered within the framework developed by Kubler-Ross (which is actually a general response to stressful situations), from the following viewpoints: 1. the person experiencing the dying process, and 2. those involved with the dying person, whether the death comes suddenly or comes with warning. It has always been assumed that the body of someone dying would be somehow recycled. Again this is an over-simplification. Consideration is given to the issues of organ donation, and the means by which recycling is carried out. Finally consideration is given to the disposition of people of particular note. Euthanasia is likely to be determined by the culture of those living in Space. Abstract: At the last conference on Space Manufacturing, I presented a paper on the problem of learning the environmental impacts of space solar power stations and on how to educate people once this information was attained. The environmental impact studies should include risk/cost/benefit analysis. This paper explains why doing a risk/cost/benefit analysis is important for all new power stations, transmission lines or other installations and shows the mechanics of how it is done. The main conclusion is that both good judgment and detailed quantitative analysis should be employed when making decisions, especially when large numbers of people will be affected by the decision. Abstract: All of human activity comes associated with some degree of risk. From a legal standpoint, the degree of risk society is willing to tolerate in conjunction with a type of activity will determine the standard of liability toward innocent third parties which will attach to such activities. This paper explores three different transportation activities of man: automobile travel, airplane travel, and space travel. In particular, the development of liability theory for airplane travel is explored in some depth. As the airplane matured from a balsa wood and bailing wire toy to a vehicle for transporting goods and people, the developed nations of the world agreed that aircraft travel was so critical that limits to liability should be adopted, such that a single air disaster would not cripple or destroy an entire industry. The result was a flourishing airline industry that moved from dependency on airmail contracts to profitable passenger service in a period of less than two decades. In the area of space travel, however, all countries in the world concluded that launching states should be strictly liable for damages. The result has been a stagnant launch industry which must contend with huge potential liabilities and shoulder enormous insurance premiums to operate. This paper concludes that similar to the early 1920s, it is time for the countries of the world to come together to agree to limit the liability for space launches to a reasonable sum, similar to that experienced in air travel after the adoption of the Warsaw Convention, thus encouraging the expansion of space travel. Abstract: This paper analyses the development of space law in terms of three generations, each with its own characteristics. The first era of space law, 1957 to 1979, was truly the era of international space law in which the players were almost entirely nation states and only the United States and the Soviet Union really mattered. The second transitional era, 1979 to 1991, was a period in which international space law atrophied and domestic, space law emerged to fill the gap. This period was characterized by the increase in nations involved in space and the concomitant rise in private enterprises. This paper suggests the beginnings of a third era after 1991, characterized by the fall of Communism, removing the major condition for the general anti-private enterprise bias in much of space development that encourages a new public-private balance in space activities. Abstract: This paper introduces a new metal fabrication technique which may have value for the conversion of extraterrestrially-derived metals into useful shapes. Criteria are suggested for assessing the value of various fabrication methods for space-based manufacture, and the merits of different techniques are discussed. Also, there is some discussion of the use of this method to lower the cost of terrestrial launch vehicle manufacture. Abstract: Lunar lava tubes, large caverns formed by lava flows on the surface of the Moon, can provide safe shelter for lunar colonists. A colony may start as a cluster of inflatable or modular structures within a lava tube. Over time, permanent settlers could seal the ends of a length of tube with indigenous materials, add atmosphere, and use the entire volume of the tube segment as living space. Abstract: With this paper the authors approach their main topic, the conceptual design of big space stations by creating a step by step system of generations (stages) of space stations and space colonies. The presented General Time Table for Space Exploration (GTTSE) is a coordination and planning instrument which visualises potential space budgets giving also a survey of possible or planned time-extensions of space projects in their intrinsic dependence from each other. The proposed space station projects are divided in categories from ST1 to ST4 (stage 1 to 4). Two basic ST2 stations (“Wheel” and spherical design) and a (cylindrical) ST4 space colony are highlighted from the point of view of general and structural design. For ST4 an artificial eco-system has been analysed, concentrating on the close relation between “climate-models” and space colonies like ST4. It is shown that the structural design, a double membrane-space frame-aided system chosen for ST4 is strictly dependant on the applied climate-model. For self-contained climate systems the authors established a maximum and minimum size space colony. The proposed structural systems are also considered necessary to improve the safety aspects of a space station in case of meteorite damage. Abstract: This paper discusses a departure from the standard approach for deployment and outfitting of a Space Shuttle External Tank (ET) for onorbit applications. Since the beginning of the development of the ET for the Space Transportation System (STS) project, a multitude of concepts have been proposed for using the ET as a space platform. The design studies are based on three major assumptions: 1) free delivery of the ET to Low Earth Orbit (LEO), 2) availability of the shuttle for outfitting, and 3) extensive use of Extravehicular Activity (EVA) and telerobotics to accomplish the outfitting. However, the design studies have all encountered the following three obstacles: 1) limited availability and timeliness of STS flights, 2) the high cost of EVA, and 3) reduced funding in telerobotic development. The development and use of the ETs for complex space platforms becomes even more imperative with today’s space programs facing funding reduction and/or implementation delays, cancellation, and the possible elimination or reduction in the number of STS flights in favor of various cargo vehicles and the Personnel Launch System (PLS). With these considerations and the assembly problems that influenced all the design studies, a different approach must be found to enable a more near-term realization of using the ET for onorbit applications. That approach is not to be found in any innovative deployment and outfitting scenarios but in a return to the lessons learned from the Skylab project. An orbiting space lab/platform would be constructed from various modified ET components. The lab could vary in size depending upon how many LH2 tank barrel sections are used. The basic ET structure and tooling would be utilized to assemble a platform based on the customer’s requirements. In addition, the equipment and systems for a space lab would be outfitted and tested on the ground before the platform is launched. This method follows the installation and testing procedures currently being used in the commercial satellite industry. The completed space lab/platform would be mated to a launch vehicle and delivered to orbit. Upon insertion into orbit, the lab’s solar arrays, radiators, and antennas would be deployed and become fully operational. Without specifying any one particular mission, this paper examines how the modular ET-derived space platforms can offer a number of different configurations for individual users such as commercial enterprises, Government sponsored scientific research, and DoD. Abstract: Living in and operating Biosphere 2 presents a unique opportunity to study the practical issues humans confront each day in managing a large, complex closed habitat. This paper illustrates the impact such a system has on human well-being and the demands it makes on human ingenuity and intelligence in operating – particularly in view of the very rapid response time of a closed system. The complex interaction of every component in a created ecological system (through such processes as leaching of metals or outgassing), the effect of different environmental factors (such as light levels, seasonal variations, atmospheric content and flux rates), the isolation of populations from their previous genetic pools – these factors and more underline the importance of the humans as integral components in the management of ecological, regenerative systems. In miniaturizing and creating model biosphere laboratories, scientists face a myriad of unknown factors. Long-term study of Biosphere 2 biomes affords opportunities for environmental studies of potential value to restoration ecology, the dynamics of small populations, and to teaching how the interaction of these ecosystems maintains biogeochemical cycling of elements. Such studies will undoubtedly prove useful to both better understand how the ecosystems of Earth operate and to improve our ability to build biological life-support systems in space. Abstract: This article will examine a beamed-energy propulsion system wherein the vehicle carries an array of tubes which are heated by a ground-based laser. The tubes carry the propellant, water, from the storage tank to the thrust nozzles, superheating the fluid to 2000K before it reaches the nozzles. The model examined is a 20,000 Newton engine with a thrust-to-weight ratio of 1.3, with no payload. Numerous assumptions are made, the major assumption being that materials exist which can withstand the high temperatures and pressures required of this model. The model is developed to determine tube length required for the fluid to reach 2000K, mass flow needed to produce the thrust, and final velocity of the vehicle assuming complete usage of the propellant. Once the model is developed, we examine what changes are produced by varying mass-ratio, temperature, tube diameter, and mass-flow per tube. Based on this information, we suggest an ideal version of the proposed model, while realizing that practically speaking, the materials to build such a model do not yet exist. Abstract: Space exploration and extraterrestrial resource utilization research programs are being encouraged to develop equipment systems faster, cheaper, and better. In support of this philosophy, the U. S. Bureau of Mines is applying terrestrial mining experience and technology to the conceptual design of lunar mining equipment. Previously proposed lunar surface mining equipment designs were reviewed for compliance with the lunar environment and for adherence to mining principles. Current Bureau mining research programs were evaluated for potential lunar application. Several projects that have operational terrestrial prototypes, which could be adapted to the lunar environment, were identified and are presented in this paper. Abstract: The “overview effect”, looking at the entire Planet Earth from space, has communicated the reality of the limited extent of our environment and its apparent fragility. Space continues to play a key role in understanding the Earth system processes in the Mission to Planet Earth portion of the U.S. Global Change Research Program. In addition to monitoring environmental parameters, operations in space may offer benefits in mitigating adverse environmental effects. Countermeasures such as geoengineering to mitigate the effects of change can be space-based. Examples of space-based concepts are space power systems that deliver energy to Earth, orbiting electromagnetic radiation generators that interact with greenhouse gases, space-based sunscreens that shade the earth, and the development of fusion energy using lunar materials. Incontrovertible evidence of the effects of environmental change may not be established until those changes are far advanced. To reduce the risk in policy implementation, geoengineering strategies need to be supported by technology development and demonstrations, both to discern the potential benefits and to assess the risks of execution of those strategies. Abstract: In this paper, we discuss the application of the Optical Waveguide (OW) Solar Energy System for lunar materials processing. In the OW Solar Energy System, solar radiation is collected by the concentrator which transfers the concentrated solar energy to the OW transmission line consisting of low-loss optical fibers. The OW line transmits the high intensity solar radiation to the thermal reactor which is used for lunar materials processing. In the OW Solar Energy System the intensity or the spectral characteristics can be tailored to specific materials processing steps. Furthermore, the system can provide solar energy to locations or inside of enclosures that would not otherwise have an access to solar energy. The modular system can be easily transported and deployed at the lunar site. Thermal load calculations for several reactor configurations show that process temperatures in the range of 1400 to 2500 K can be achieved at thermal efficiencies in the range of 75% to 85%. This temperature range is compatible with most high temperature processes according to a survey of In-Space Resource Utilization (ISRU) processes. Abstract: Electric thrust is the best way for freight/humans to reach planets. A pathway utilizing L1, and base on Moon, saves so much delta-V, time, and money that the cost of developing lunar base is made up in reduced cost of exploring the first planet. Two unoccupied units, the Habitat and nuclear fission Power Supply, each with its own electric thrusters, are lifted to LEO and proceed to L1 using electric thrust. In L1 the units are telerobotically mated into one Spaceship, which automatically stationkeeps until a chemically powered Lander with Astronauts arrives from LEO and docks. A small centrifuge, from which Spaceship is telerobotically controlled by crew, provides artificial gravity. Spaceship, after loading low-gravity lunar supplies (like fuels, shielding, rectennas), uses Lander’s chemical engines to obtain a lunar gravity-assist toward Mars. When chemical engines shutdown, the nuclear Power Supply is undocked and uses own thrusters to stationkeep a safe distance behind Habitat, and beams maser power to Habitat for thrusters, which thrust/brake to Mars orbit, where Lander is refueled from preparked tanker before and after landing. On return to L1, Habitat/Power Supply is parked in auto-stationkeep mode. After refueling, astronauts return to LEO in Lander, parking it until next mission. Astronauts return to Earth by shuttle. On subsequent missions, only astronauts need lift to LEO. Lander is refueled from Moon. Paper describes Russian SPT thrusters using strong magnetic/electric fields made possible in space, and which may lead to fusion-electric thrusters using D+3He as fusion fuel. Ions produced, plus Xe ions, act as propellant. A D+3He fusion reactor supplies coil current for SCM to initiate fusion-electric thruster. D+3He fusion produces no neutrons. Abstract: Existing robotic rover and space satellite technologies at Sandia National Laboratories (SNL), coupled with existing launch vehicles and converted military Multiple Independent Reentry Vehicle (MIRV) technologies, can be applied towards the realization of a robotic lunar rover mission in the near term. SNL’s Advanced Vehicle Development Department has been designing, producing, and operating prototype rover systems at the Robotic Vehicle Range facility since 1984, and has extensive experience with teleoperated and semiautonomous mobile robotic systems. SNL’s Space Systems Directorate has been designing, producing, and operating satellite systems and subsystems in Earth orbit for national security missions since the early 1960’s. The facilities and robotic vehicle fleet at SNL’s Robotic Vehicle Range (SNL-RVR) have been used to support technology base development in applications ranging from DoD battlefield and security missions, to multi-agency nuclear emergency response team exercises and the development of a prototype robotic rover for planetary exploration. Recent activities at the SNL-RVR include the Robotic All Terrain Lunar Exploration Rover (RATLER) prototype development program, exploratory studies on a Near Term Lunar Return Mission scenario for small robotic rovers based on existing space hardware technology, and demonstrations of the utility of existing rover technologies for performing remote field geology tasks similar to those envisioned on a robotic lunar rover mission. Specific technologies demonstrated include low data rate teleoperation, multi-vehicle control, remote site and sample inspection, and standard bandwidth stereo vision. These activities serve to support the use of robotic rovers for an early return to the lunar surface by demonstrating capabilities that are attainable with off-the-shelf technology and existing control techniques. Due to the breadth of technical activities at SNL, there are many supporting technology areas for space robotics applications development. These range from core competency areas in advanced aerodynamics, computing, and microsensor technologies, to the actual design, production, and space-qualification of flight components using existing in-house capabilities. These various capabilities have been developed over the years to serve SNL’s role in missions for a variety of customers, including U.S. industry, NASA, the U.S. Departments of Defense and Energy, and other federal agencies. The paper describes Sandia National Laboratories’ activities in the Space Robotics area, and highlights the laboratory’s supporting technical capabilities. Abstract: Small, low mass robots developed at the MIT Artificial Intelligence Laboratory (AI Lab) are capable of autonomous operations in a range of environments by using relatively simple operational rules and nested ‘behaviors’ rather than detailed internal modeling. We consider adapting them to asteroid exploration tasks. Current data suggest that small asteroids have a rocky regolith layer along with a large scale angular outline; this is coupled with milli-g local gravity. A mobility strategy is presented that uses an initial high survey jump followed by multiple short hops. The robot software would be able to adapt the magnitude of the hops to local requirements, analogous to the ability of the AI Lab robots to exhibit self-taught walking behavior on Earth. Requirements on the asteroid could include following the body’s rotation to maintain power and thermal limits. It should be possible for the robots to carry out simple spectral and mechanical tests of the soil using miniature cameras and insect-analogue ‘mandibles’. Small samples could be returned to a landing vehicle anchored to the asteroid. Due to the low mass of the robots, a single spacecraft launched by a small booster might carry several of them. Abstract: Carnegie Mellon University’s Autonomous Planetary Exploration Program (APEX) is currently building the Daedalus robot; a system capable of performing extended autonomous planetary exploration missions. Extended autonomy is an important capability because the continued exploration of the moon, Mars and other solid bodies within the solar system will probably be carried out by autonomous robotic systems. There are a number of reasons for this – the most important of which are the high cost of placing a man in space, the high risk associated with human exploration and communication delays that make teleoperation infeasible. The Daedalus robot represents an evolutionary approach to robot mechanism design and software system architecture. Daedalus incorporates key features from a number of predecessor systems. Using previously proven technologies, the Apex project endeavors to encompass all of the capabilities necessary for robust planetary exploration. Abstract: The “beamwalker” was generated by Martin Marietta as a rover design for a NASA mission called the Mars Sample Return Mission. With some modifications new key design goals are integrated such as: energy efficiency, superior obstacle climbing performance, low vibrational stress to the payload, traversal of unconsolidated ground, and roll over recovery are added to the previous design goals. “Beamwalker type” performance has been enhanced by adding an extra layer of mechanism which maintains a constant payload velocity. The mechanism which facilitates this functionality is focused at the main beam, the middle module, and the payload module. This maintains its constant forward momentum and velocity of the payload. The efficiency of the gait seems to be high over very rough terrain. The ability to right itself in the event of: a roll over, hangup, wedged part, or up ended is crucial for long term autonomous operation in space or hostile environments (e.g., hazardous waste disposal). This rover system has no one feature to accomplish this task but instead the whole design is cooperatively able to provide many different kinds of roll over recovery. The beamwalker is capable of a tortuous gait, superseding the normal gait activity. It may be that the terrain has become so rough that the rover must plan and place each footfall with great care. This indexed motion is characterized by higher power consumption per foot of travel, more computations per foot of travel, and greater chance of losing its poise. The climbing of obstacles is clearly an interesting possibility, allowing access to very remote terrain. The alternate side of tortuous gait is that damage can occur to the rover and instead of turning into an immobile monument it can still hobble along. This making the most of the situation has great advantage when in a hostile environment and help is not at hand. The solution to this problem is again integrally a part of the designed structure. Abstract: Since Caltech/JPL observations suggest possible water ice at the north and south poles of the planet Mercury, it is now feasible to consider a new class of human exploration missions to these sites, and three classes of robotic precursor missions that would precede human exploration (impact/orbital spectroscopy, lander, sample-return). Mercury polar ice could provide neutrino detection opportunities and would provide in situ resources for refueling spacecraft for return to Earth. REPORT CARD ON PROGRESS: VISION OR REALITY? Abstract: This paper reviews the vision for the human breakout into space as contained in O’Neill’s classic work, The High Frontier. 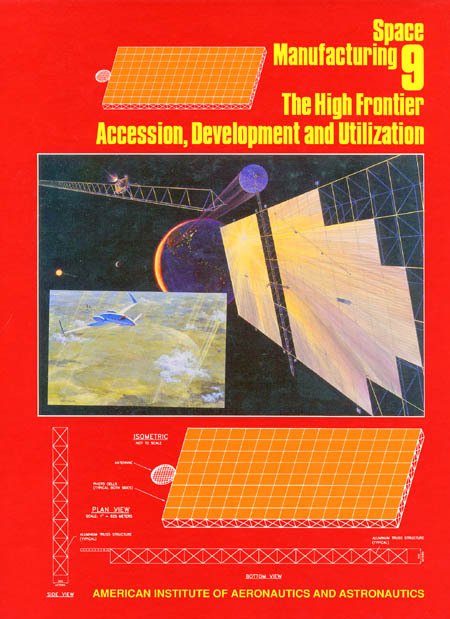 The status of key technologies and programs needed to open the High Frontier are examined. A suggested strategy for near-term action to attain our long-term goal is presented. Abstract: A formal discussion was held among Conference attendees to learn if there was any consensus on how to most effectively direct our efforts toward the settlement of space. After opening remarks by an invited panel, in which the roles of government, business, and small organizations or individuals were considered, a wide-ranging exploration of personal views on many space-development matters ensued. From this we conclude that there is no consensus, but that there is direction that may be used to advantage. Abstract: The present paper attempts to provide a coherent ethical foundation from which the question of whether we should spread life beyond Earth may be addressed. First, three criteria are presented with which proposed ethical foundations may be judged: the availability of supporting empirical evidence, biological plausibility, and inherent value or consistency. The criteria are then used to judge the proposed foundations of pleasure and pain, life itself, natural rights, integrity/diversity, and the soul. It is concluded that only the proposal of pleasure and pain succeeds in passing all three criteria. Life itself and integrity/diversity fail criterion three. The soul fails criterion one. And natural rights fail all three criteria. The foundation pleasure and pain is placed within a utilitarian framework and criticisms of utilitarianism are addressed. Finally an implication for space habitation is drawn with the help of two axioms: 1) Life which exists in a fulfilling environment (in which pleasure is predominant rather than pain) tends to be of positive value, 2) In such an environment two lives are on average of twice the value of one life. Given some qualifications, these axioms lead to the conclusion that if life were to spread throughout the solar system or the galaxy in new fulfilling worlds and the population of sentient beings would thereby increase countless times, then the total value of life would itself increase countless times. Abstract: With over 3,200 launches (3,800 payloads put into orbit) since the beginning of spaceship travel, 7,000 + artificial objects have been orbiting the earth (2+ million kilograms). They have been tracked by the Space Surveillance Network (SSN) operated by the United States Space Command (USSPACECOM). To date, only 6% of the cataloged objects are functional satellites, allowing the rest to fall into the “orbital” or “space debris” category. The debris includes a wide assortment of artificial satellites ranging in size from a millimeter or smaller to a fully deactivated satellite or spent rocket stage. Orbital debris travels in a wide variety of orbits used by Earth orbiting satellites. Orbital debris may orbit the Earth for as long as centuries moving in many different directions and velocities. With a velocity of 4 to over 8 kilometers per second they will cause potential hazards to working spacecraft, space stations, satellites, processing facilities, etc. The below paper will outline a workable systems for: (1) Rendezvous with existing space debris and initiate deorbit for vaporization in the earth’s upper atmosphere or shuttle interception. (2) Capture defunct satellites (LEO, GEO, Sun Synchronous, HEO, etc.) as well as radioactive ones for shuttle interception. (3) Utilization as space weapon (with modification). (4) Rendezvous (modification) with material sent into orbit by mass driver and transport to processing facility in higher orbit (increase mission effectiveness). With constant communication Tracking and Data Relay Satellite Systems (TDRSS) will work with a defunct or near end of mission satellite can use its residual fuel for deorbit and rendezvous with the Debris Collection System (savings of fuel and weight) and initiate any of the above mission profiles. Abstract: Some years ago an unmanned interstellar probe system, based upon and elaborating the “Daedalus” system, was described in which the probe replicated itself at the target star system. To carry out such replication a very versatile manufacturing system is required which is easily adapted to more complex tasks given maintenance of interstellar communications, by either radio or laser, with the home star system to update the programming as time goes by. This leads logically to two forms of activity, l) the development of the “Sentinel System”, and, in turn, 2) the evolution of a cosmos spanning, evolving, non-biological intelligence. The “Sentinel System” operates at three levels of activity. A. Where a star system is found that cannot have indigenous biological systems, a probe sets up a beacon to attract colonists from its originating system. B. Where a planet is found that has a high probability of intelligence evolving, a probe sets up a beacon to warn away all colonising ventures, observes the evolution of the intelligences, and sets up an interface with the wider interstellar civilization once the intelligences become Space travelling. C. Where a star system contains an uninhabitable planet which could become the abode of evolving intelligences, a probe carries out the necessary terraforming and introduces low level life forms, created from computer generated templates, to initiate an evolving biological system, and then enters the B. mode of activity. In the meantime, by parallel processing, the entire network of probes, through their mutual communications, evolves into an increasingly powerful, increasingly autonomous, self-regulating intelligence that can continue to carry out the function of fostering.